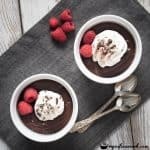 This rich and decadent homemade chocolate pudding will quickly become one of your favorite desserts! As a kid, I can remember taking my salad plate to the Bonanza salad bar and filling it will chocolate pudding. I think this was probably typical 10-year-old behavior. I always loved family dinners out. And I always loved chocolate pudding. I also have memories of my mother making homemade chocolate pudding. I’m pretty sure she cheated and used a box mix, but it didn’t matter. It was still always a favorite. 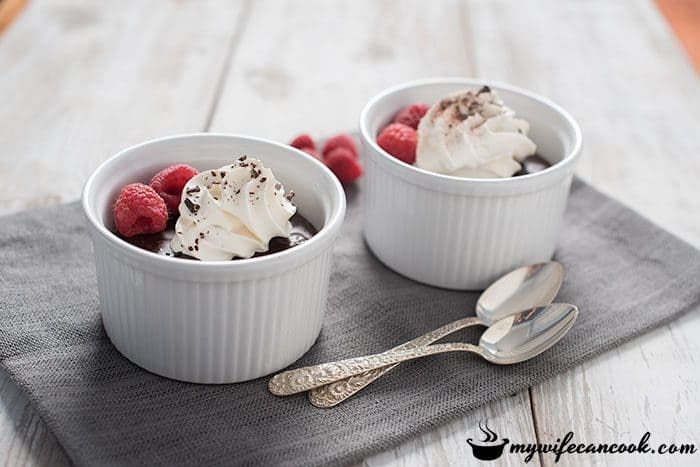 With Valentine’s Day just around the corner, we’re hoping to share that favorite with the next generation with our own homemade chocolate pudding recipe. Hi there, this is Greg from My Wife Can Cook where we help busy families take back time and find the balance between healthy eating and those desserts you just can’t live without! What can I say, we are a family that loves our desserts! With a household of 5 we’re pretty much always close to someone’s birthday and so we’re always arguing of which cake is the best birthday choice? Top contenders are always this delicious Heath Bar Cake with its caramel infused center and cool whip and heath bar crumble topping, and this Oatmeal Cake with its amazing coconut walnut icing. What would you choose? You win either way, both cakes are fantastic! When there’s not a birthday, there’s always a holiday or a season or a special occasion of some sort that gives us a reason to fix dessert. In the summers we fill up on Blueberry Crisp and Homemade Popsicles. In the fall it’s Chocolate Pecan Pie and Pumpkin Cupcakes with Buttercream Frosting. Now, we do try to eat healthy most of the time. But the desserts…the desserts are the counter-balance, the moments of indulgence, joy, and tradition that we enjoy passing from generation to generation. Fall is never complete without apple-picking and making homemade apple crisp. The Christmas holiday isn’t complete until we’ve made and enjoyed Grandma Leone’s famous shortbread. These traditions are important. And these traditions continually bring us joy. February is a big month in our house. Along with 2 birthdays to celebrate, there is also Valentine’s day. Our Valentine’s day tradition includes exchanging Valentine’s cards and celebrating with a homemade dessert. This year we’re celebrating with easy to make homemade chocolate pudding. It’s our way of passing joy to the next generation and establishing a new tradition. We hope you’ll try it out. Maybe it will become one of your cherished traditions. All the best to you and yours! This is my favorite recipe for rich, decadent homemade chocolate pudding! It doesn't take long to make and is the perfect dessert for any night! Whisk together cocoa powder, cinnamon, cornstarch, and sugar in a cold saucepan. Whisk in milk and heavy cream. Bring to a simmer over medium low heat, stirring constantly, until mixture thickens. Add chopped dark chocolate and stir. 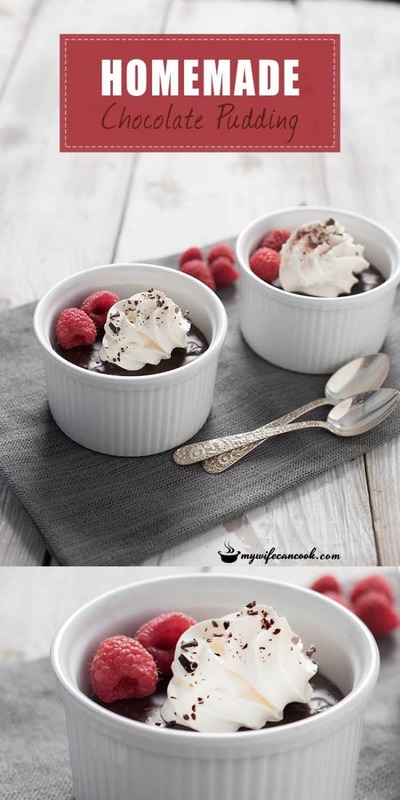 Pour into individual ramekins or dessert containers and cover surface with plastic wrap. Refrigerate for at least 2-4 hours. When ready to serve, whip heavy cream, confectioner sugar, and vanilla until soft peaks form. Remove plastic from pudding and top with whipped cream and raspberries.